One of the most common questions I am asked is, "How do I go about smudging a house?" 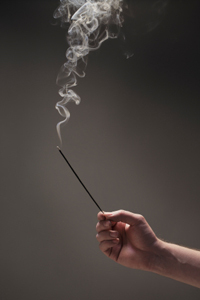 A typical house clearing is one of the most complicated and lengthy sacred smoke rituals most people will ever engage in. Even though the house smudging ritual is complex, it is a good idea to be prepared to smudge a house whenever you feel that it is necessary to clear negative energy out of your home environment. 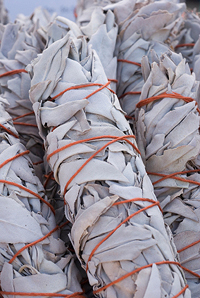 This type of Sage and Smudge ritual or ceremony is most often done around the time people move into a new home, to clear out any negative energy that may have been a part of the lives of the people who lived there previously. However, there are other times when a house smudging is a called for, times when a major purification, a Clearing and Healing Sage and Smudge ceremony is needed in the entire residence. This type of spiritual housecleaning ritual is performed to acknowledge that one cycle has ended and to announce a new beginning - a starting point in your energetic, vibrational and spiritual connection to your world. And since your home is the center of your personal world, it is very helpful to carry out a Whole House Smudging Ceremony to clear the entire space and make it ready for the next cycle. When someone new moves into the home to live with current members of the household, bringing their possessions (possibly their children and/or their pets) into the space. Following the completion of a major home improvement project. Following a Feng Shui consultation, and after any changes suggested by the Feng Shui Practitioner have been made to the interior (or exterior) of the home - changes that are meant to shift/improve the energy-flow inside the home. Following a divorce or separation, where one party has moved all of their possessions out of the mutual home and into a new home of their own. Following a serious illness or death of someone (or a cherished family pet) who has lived in the home. Whether you are buying a home, renting a home or moving into a new apartment or condominium, you will want to perform a Sage and Smudge Home Clearing ritual at least one time during the first month you are living in the new space, preferably at or around the New Moon. If there is time between when you take possession of your new home, and the time your furniture and belongings are moved into the new home, you may want to do an initial Sage and Smudge ritual to clear negative energy before your furniture and possessions arrive and you start unpacking. If you are unable to carry out a Complete House Clearing before your furniture and possessions arrive at the new dwelling, or if you don’t unpack everything the first month you are in your new home, you may want to perform an initial Home Smudging Ritual during the first month, and another after everything is unpacked and moved into its new space. For a variety of detailed Sage and Smudge Room and House Clearing ceremonies, tips, and techniques, order Sage and Smudge: The Ultimate Guide now.